What external and internal forces combine to create the perfect storm that causes a human being to become twisted? This is not a rhetorical question. Ron Shaw was molded into such a twisted boy and man. Look inside his life. Go back with Ron to the hell of his youth, the conflicts as a young man, and the desire to survive as an Atlanta police officer. Witness the struggles in graphic detail that hopefully made him into a better human being. What you will read, and with Ron Shaw live in words, is raw, rough, rude, deadly, and real. The stories contained from page one until the last typed word are precisely what transforms a man or any person into a twisted being in search of their humanity. This is my third book that is actually the end of a loosely constructed trilogy of SEVEN FISH TREE, TRANSMUTATION, and THE YELLOW BUS BOYS. Chronologically this one occurs before THE YELLOW BUS BOYS, but it was my third book written and published. It’s a cop book with real life experiences by me as an Atlanta Police Officer. 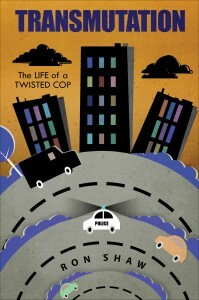 It may well be the rawest, true-to-life cop book out there. I weave past experiences and stories into my day to day experiences in uniform. It’s the real deal…tragic and very sad in many of the stories, yet, humorous in others. TRANSMUTATION Is a true rollercoaster trip, as you ride-along with me on patrol, at home, and in earlier stories before becoming a copper. All of my characters are either real or based on real people, living and deceased. Many remain nameless or with changed names in a true effort to protect the innocent, as well as the guilty. The events that happened are as real as me and my characters. Some of them were deadly. The ex-Marine demanded and advised, ‘Don’t make any quick movements or you’re dead. Don’t go for your gun or radio or I’ll shoot. Just stand there and listen because like me you’re dead already. ‘You know this gun is fully loaded with a live round in the chamber; you better believe I know how to use it. Killing’s easy for me; it’s the living part that’s hell and we are both in hell.